As a brand, Sakae may be a recent arrival, but its decades of manufacturing excellence shine through in this snare. 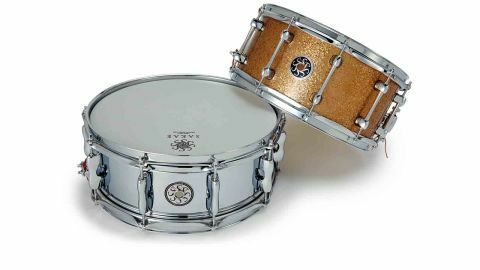 This steel snare was launched - along with Sakae's entire current catalogue - in October 2013. Though only emerging recently as a brand, Sakae has been manufacturing drums for nearly 90 years, building Yamaha's high-end ranges for over four decades before finally going it alone. The steel shell is rolled and welded (so tidily that the join proves extremely difficult to spot) before being chrome plated. A pair of horizontal creases (above and below the lugs) run the width of the drum - a neat detail which displays Sakae's skill - while the inside of the shell has a semi-matt brushed finish. "This shell is almost perfectly round, deviating by a mere 1mm"
Bearing edges are folded over at 45° and generous snare beds are found snareside. Ten double-ended aluminium bridge lugs - similar to those found on the company's classic Trilogy Series snare - are separated from the shell by rubber gaskets. This shell is almost perfectly round, deviating by a mere 1mm. Sakae offers two different types of hoop and the snare is supplied with Righty Halo hoops, which are 2.3mm thick, triple-flanged and turn outwards, conventionally. This snare wastes no time announcing its arrival, responding instantly to the most tentative of stickings with a sharp metallic snap. The note is bright and keen, yet warm, and infused with sympathetic overtones, particularly away from the centre of the head. At mid to high tunings it is at its most authoritative, cutting across the mix with almost casual ease. Pushing the tuning further upwards focuses the note into an even harder whipcrack; here the sound is so tight that some of the drum's power is dissipated as a result. Back in the sweet spot its wider spread makes for commanding backbeats without inhibiting any of the drum's natural agility. Rimshots are genuinely ear jarring and ring on for some time (it's hard to tell at what point the drum stops while the ears continue) and cross stickings are zingy and open.